A juried film shorts festival inviting submissions inspired by Felice Varini's Square with four circles, Sites. Camera. Action! premiered to a standing-room-only house at the Whitney Humanities Center in May 2011. 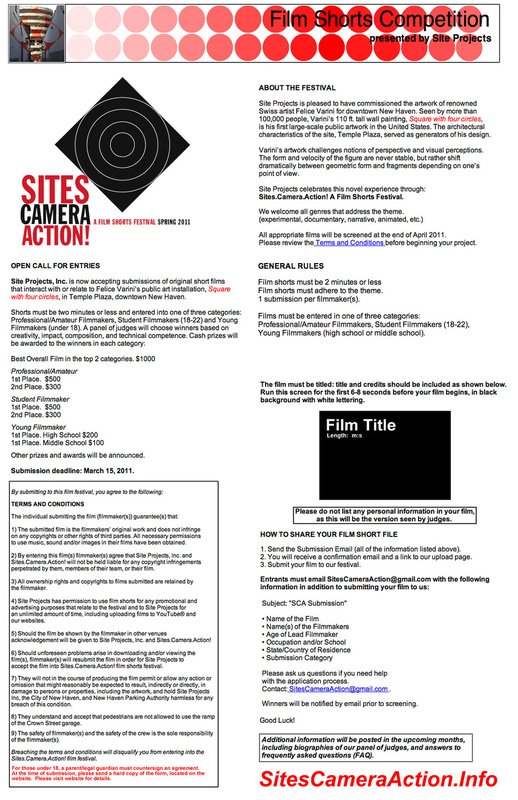 See the request for submissions and prize-winning film-shorts below. Site Projects’ fourth commission by renowned Swiss artist Felice Varini, Square with four circles, is on view now in Temple Plaza, downtown New Haven. Now seen by more than 100,000 people and covered by blogs and magazines around the world, this artwork marks the first time a Varini ‘urban intervention’ can be seen in the United States. Like a 3D movie, Varini's 110 ft. tall multi-dimensional painting is based on an optical trick. The viewer's perspective shifts between painted fragments and the geometric form, which coalesces at a single vantage point. Professional, amateur and student film makers are encouraged to submit film shorts, 2 minutes or less, that interact with or relate to Square with four circles. Narrative, documentary, animation and experimental, etc. : all genres allowed. To see the rest of the videos, head to our Vimeo page, here.